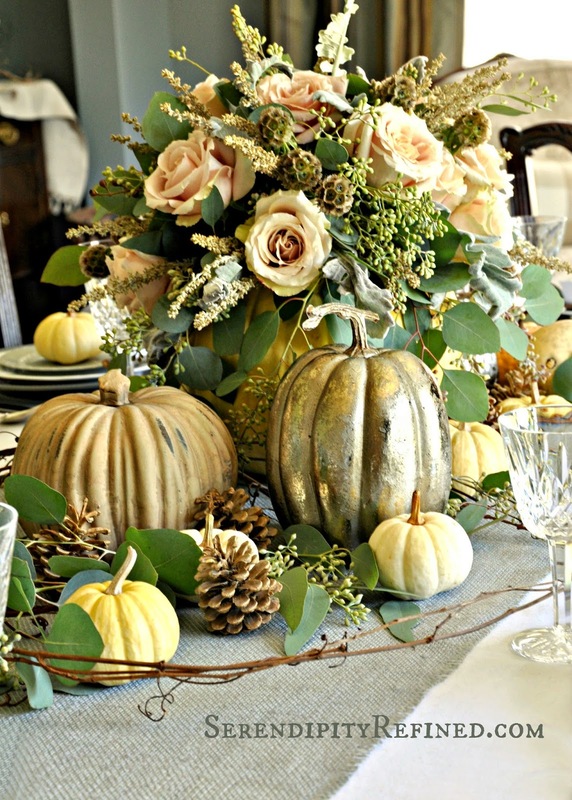 This year, my Thanksgiving table decor is pastel. Well, not really pastel. It's gray and white and metallic, too. I knew that I wanted something a little different this year even though I'll be setting the table and baking pies at my mom and dad's home again this year because I don't really have a working kitchen. The inspiration for this year's table decor came from a photo that I found on Pinterest a couple of months ago. 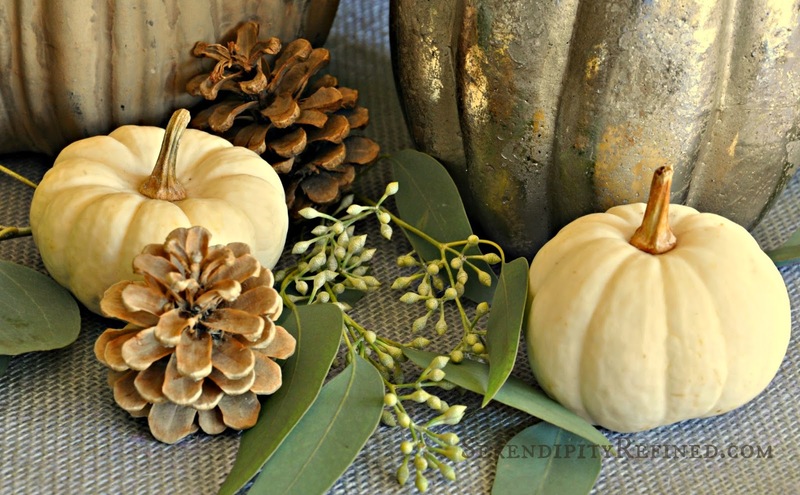 I knew as soon as I saw it that I'd be repurposing one of the white pumpkins from my fall front porch to use as container for the centerpiece. 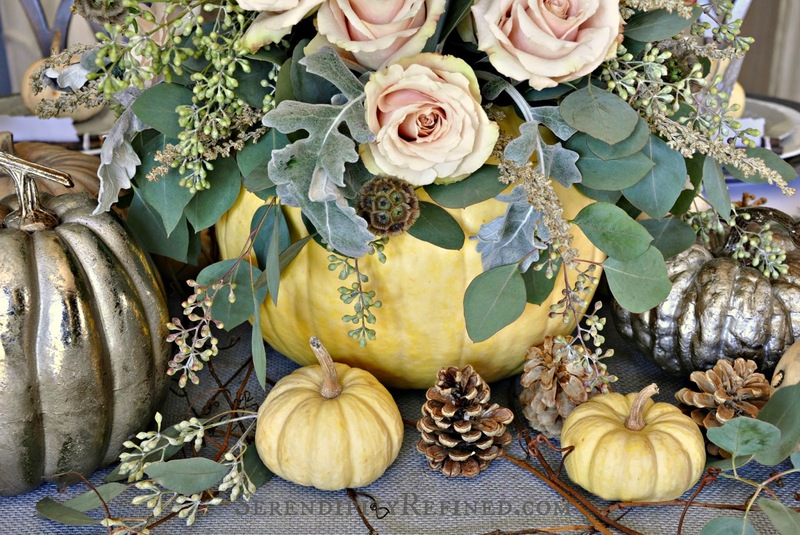 After removing the top and inside of the pumpkin, add a glass vase to the inside of the pumpkin. This will make it easier to water the flowers and to ensure that it won't leak onto the table. 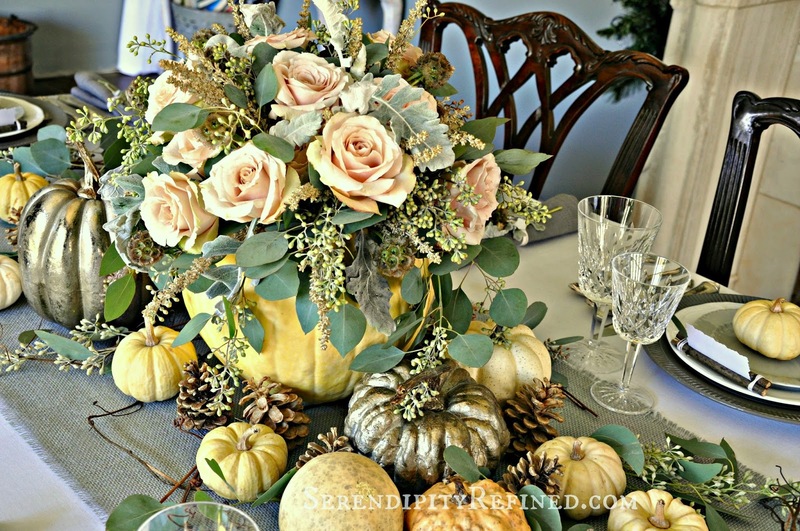 The vase is then filled with dusty miller, seeded eucalyptus, seed pods from scabiosa, white sage flowers, and dusty peach roses that look like the tips of the petals are tea stained. The photos don't do them justice! 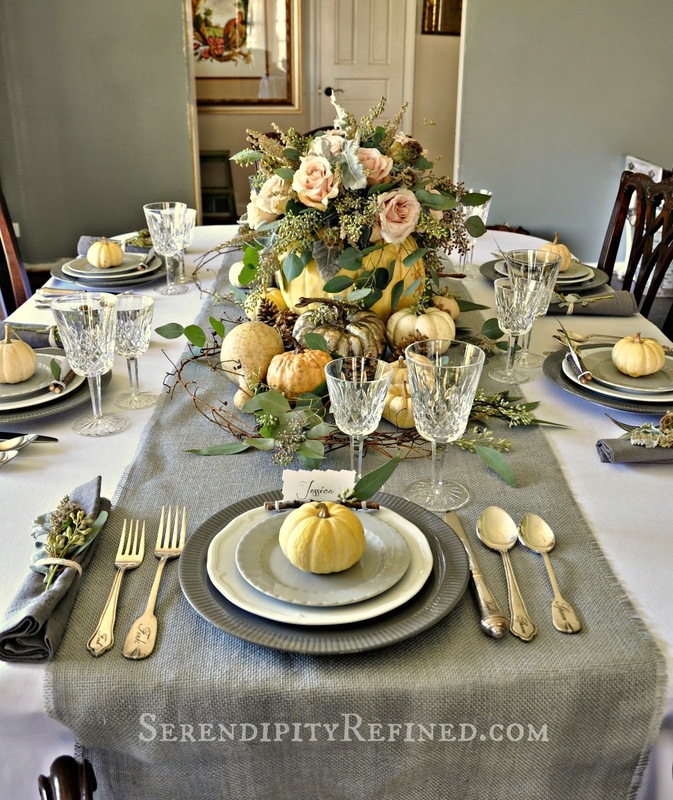 I used a plain white table cloth and a piece of gray burlap as a runner. I cut it to a width of about two feet and simply frayed the edges. 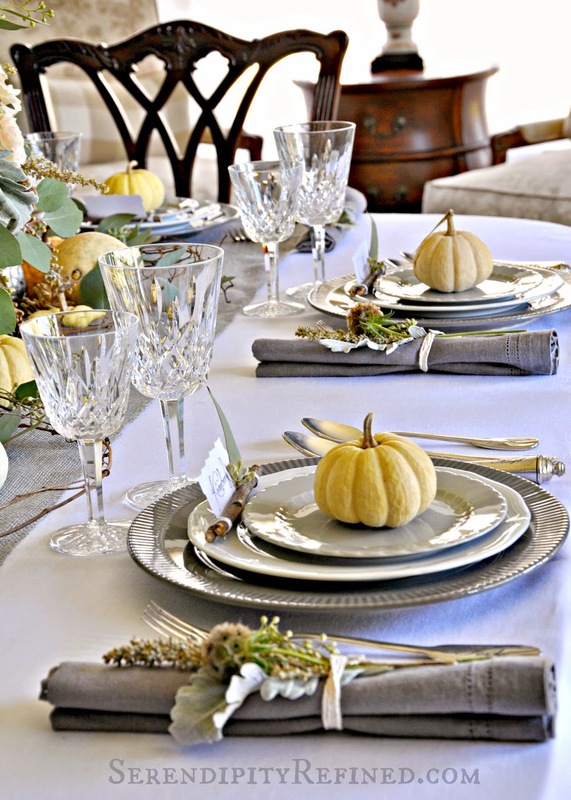 In addition to the pumpkin centerpiece, I wound a few pieces of grapevine in the center of the table and added miniature pumpkins, gourds, and some of the bleached pine cones that I made last year along with just a couple of spray painted mercury glass metallic pumpkins for accents. Place settings were kept simple but with an unexpected touch of elegance. 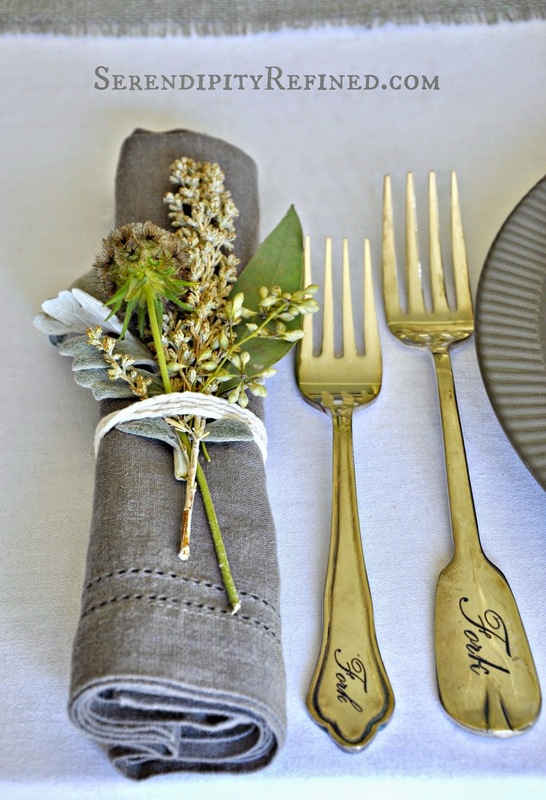 Gray and white dishes and rustic silverware join with plain charcoal linen napkins tied with simple cotton twine which had a few sprigs of greens tucked into them. Crystal glasses mix with rustic place card holders made of twigs that I gathered from my yard.